This was the scene along the Apple Capital Recreation Loop Trail shortly after Saturday's start of the Columbia Valley Girls on the Run 5K and 2K race. WENATCHEE — There may not have been a more festive place in the entire Wenatchee Valley on Saturday morning than at Pybus Public Market. Yes, the new public market was enjoying its second weekend of business, with the farmers market and inside vendors attracting a large crowd. 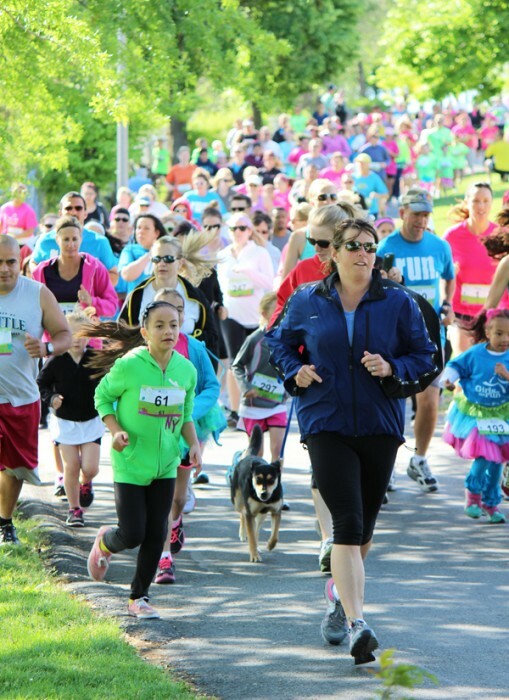 But the market also was the staging area for the inaugural Columbia Valley Girls on the Run 5K/2K race, which attracted an additional estimated 500 participants, spectators and volunteers. It was the first sporting event held at Pybus. The scene was colorful with some girls getting their hair painted in the group’s trademark colors of green and pink, and others milling about inside with their families. Outside, the adults who had come to race readied themselves along the adjacent Apple Capital Recreation Loop Trail. Although the event was officially for Girls on the Run and Peshastin Striders members, organizers opened it up to the general public and to adults as a fundraiser. When the race finally began at 9 a.m., a large hoot arose from the runners and walkers — both big and small. 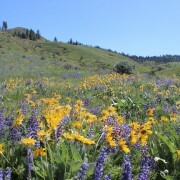 Girls on the Run is an after-school nonprofit program for third- through fifth-graders that is affiliated with Columbia Valley Community Health. Besides instilling fitness, the program is meant to help girls develop a positive self-image and to better handle peer pressure. Peshastin Striders is a running club for elementary school students in the Peshastin-Dryden area. On the racing side, Doug Wood captured the open men’s 5-kilometer title, covering the course in 18 minutes, 43.4 seconds, and averaging 6:02 a mile in the process. Finishing second was Wenatchee’s Dan Kavet, who was clocked in 19:25.6. Third was Erik Johnson in 21:56.0. 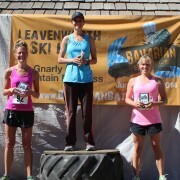 East Wenatchee’s Melissa Fenter won the open women’s 5K in 23:22.3. Wenatchee’s Roselle Wood took second in 23:55.5. In the Girls on the Run 5K race, McKenna White came away with the title in 23 minutes and 2.2 seconds. Will White was runner-up in 24:12.7, and Molly Oswald was third in 24:15.5. In the Girls on the Run 2K race, Tatum Grosdidier took first in 12:19.8, followed by Aiden Hawes in 13:37, and Olivia Harle and Karissa Harle, both in 15:04.9. In the Peshastin Striders 2K race, finishing first was Karsten Bowles in 11:17.3. Runner-up was Anthony Villalobos in 12:18.5. Calvin Wilder was third in 12:26.0. 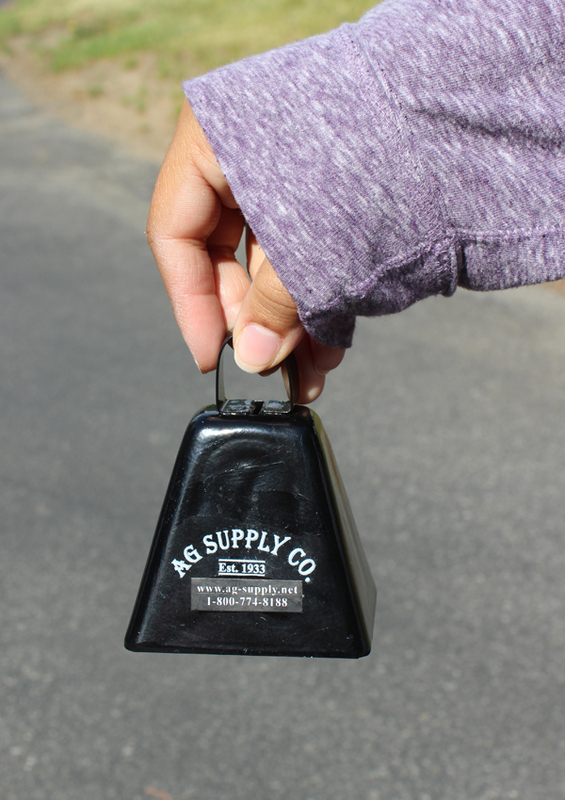 There was plenty of cowbell heard along the course. More than 360 people registered for the event, which raised money for local Girls on the Run scholarships. That included about 130 elementary school girls and their adult running buddies. The rest of the field was made up of the general public and about 40 Peshastin Striders members. Mendez said she anticipates the Girls on the Run event returning in 2014. “There will be a Part II,” she said. 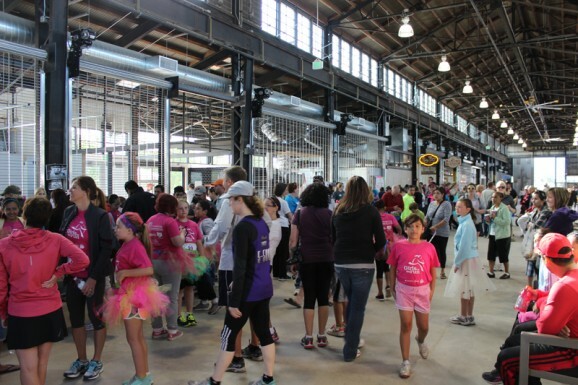 Girls on the Run participants register inside Pybus Public Market on Saturday morning.